Kansas City is a metropolis filled with countless tales. Every corner of the city has its urban legends, myths, and tall tales. Somewhere along the way, many of these began with an inkling of truth and were merely stretched with passing time. Not long after the Civil War ended, many pioneers would pass through Independence on their way out west. A steady stream of travelers would have traveled along a path that would have led them past the Vaile Mansion at 1500 North Liberty Street. Many sories were spun regarding this massive home that rose high above the rolling hills. Harvey Vaile was born on the east coast and moved westward after his early education. He studied law in Louisville, Kentucky and set up practice in Indianapolis. He dabbled in other enterprises before moving to Kansas City in 1859. Here he entered into a law partnership with J.J. Crandell. Vaile was an abolitionist, which was an unpopular position in Missouri around the Civil War era. In 1861, he married Sophia Graham and they made home in Kansas City. Around the end of the war, they moved to Independence and eventually amassed about 2000 acres in Jackson County. This land contained orchards, vineyards, farm and ranching properties. These investments made the Vailes quite wealthy. In 1863, he joined with a couple of partners to contract a mail route for the United States Government. This enterprise was a short turn investment for Vaile and he soon left the merger. The Vailes made a trip to Europe where they visited a Norman chateau in France. 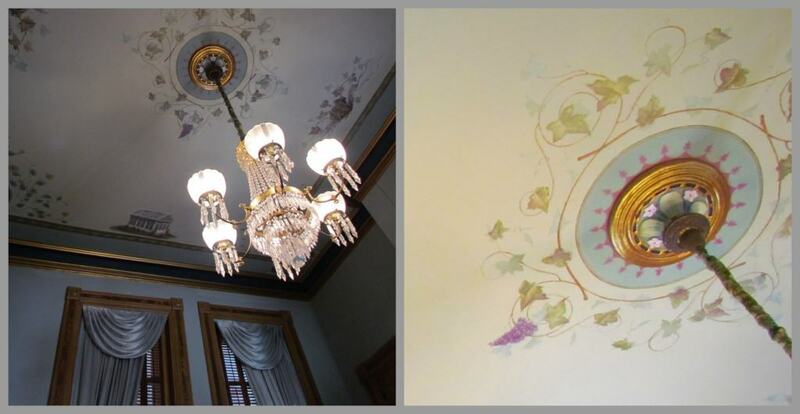 The architecture struck their fancy, which is evident in many of the flourishes found inside and outside of the mansion. The estimated date of the beginning of the house construction was around 1880. Asa Cross, a friend of Vaile and a noted architect, was commissioned to design the structure. His trademark was excessive ornamentation. The exterior is a dizzying array of towers, turrets, arches, and 112 tall, but narrow windows. When we entered the home’s east facing front door, we found ourselves in a vestibule. The thirteen foot ceilings made us feel diminutive, in such a grand space. On either side is a parlor, one for men and one for women. 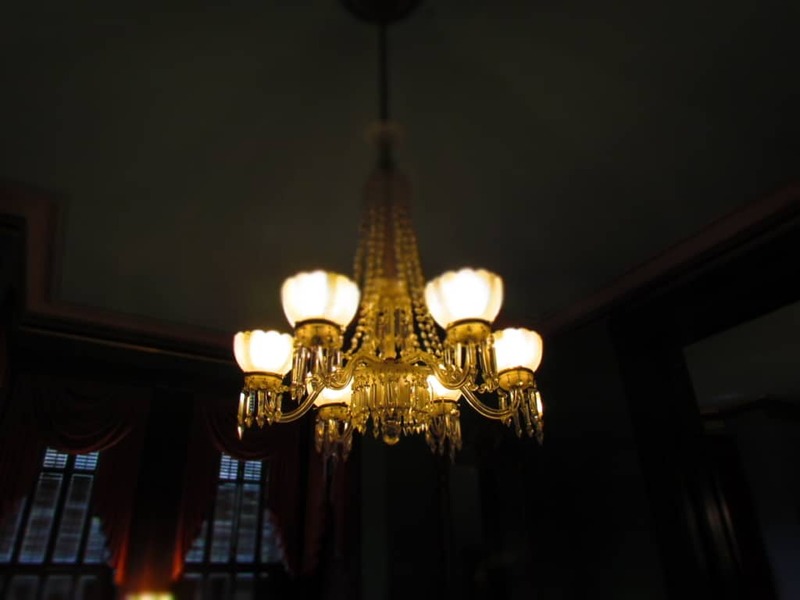 In both rooms are matching chandeliers that were originally destined for the White House. In the lady’s parlor we found one of the nine fireplaces in the home. This one is made of white marble with onyx pillars. One of the volunteers told us it cost more than $1500 in those days. As we made our way through the first floor, we found each room filled with an amazing collection of period furnishings. The place looked like it could be moved into and ready for occupancy at any moment. 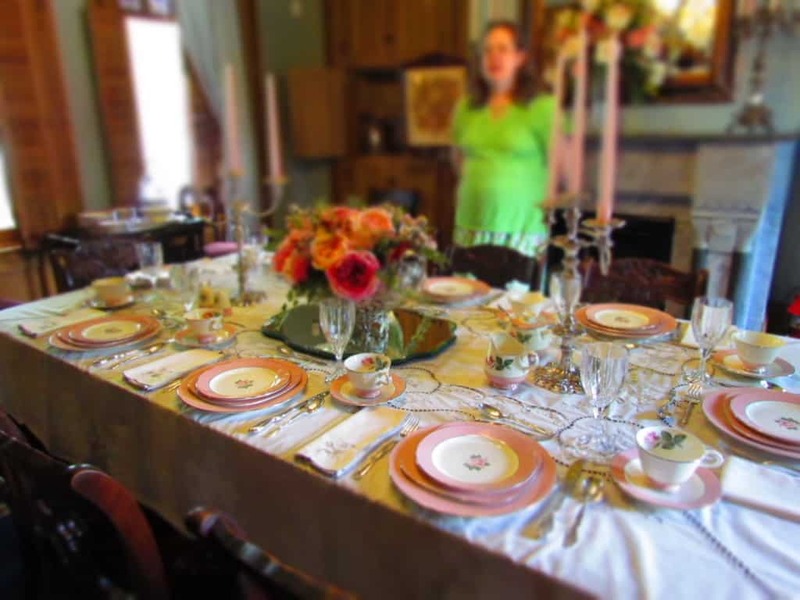 The dining room was prepared to serve eight diners on its fine china. It was in this room that we were first made aware of something that had passed our observation. The volunteer in this room asked us if we had noticed the painted ceilings. Of course we had not, since we were so busy trying to take in all of the sights at eye level. We took a moment to gaze on this one and noticed the fine detail that has held up after more than 130 years. Everywhere we looked we were amazed at the attention to detail in the furnishings. Much of the woodwork is faux painted to mimic hardwoods that were not found in the territory. It would certainly take a more educated eye than ours to tell the difference. 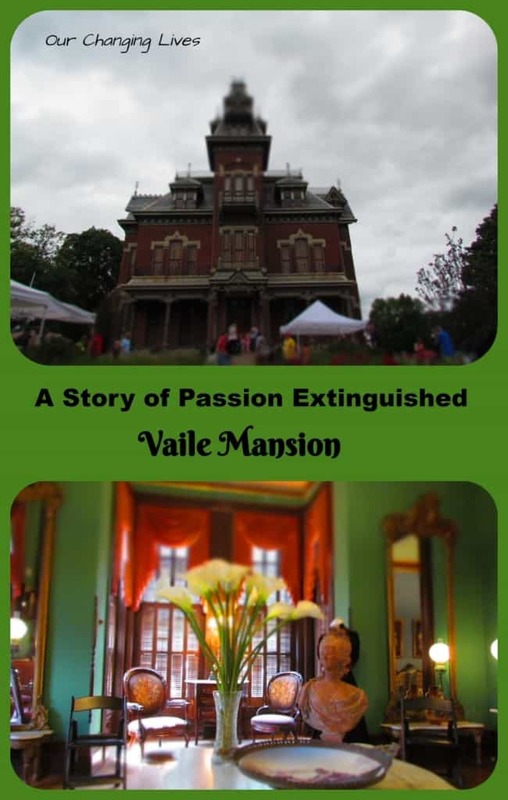 The Vaile Mansion has three floors, but only two are open for public display. The uppermost floor is unfinished, since Mrs, Vaile passed away before its completion. We made our way up one of the staircases to the second floor, which is where the bedrooms are found. The rooms are decorated just as lavishly as the ones on the first floor, but there is a little modesty taken in some of the furnishings. It was still so amazing to see the massiveness of a home that would have dwarfed its neighbors at the time. Amidst all of the bedrooms and the two bathrooms on the second floor (including copper tubs) we were directed to Mr. Vaile’s private smoking room. Designated as “Nature’s Bower”, it sits inside the eighty foot tower seen at the front of the house. The most intriguing characteristic is the woodwork. Here we also found more faux painted wood grain, but hidden inside the design are hundreds of human and animal caricature faces. We are sure this elicited some interesting remarks from guests. Since the Vailes had no children, the home soon left their family’s hands. It was willed to the Kansas City Ladies College and changed hands a couple times over the next few generations. Eventually it was deeded to the City of Independence and placed on the National Register of Historic Places in 1969. 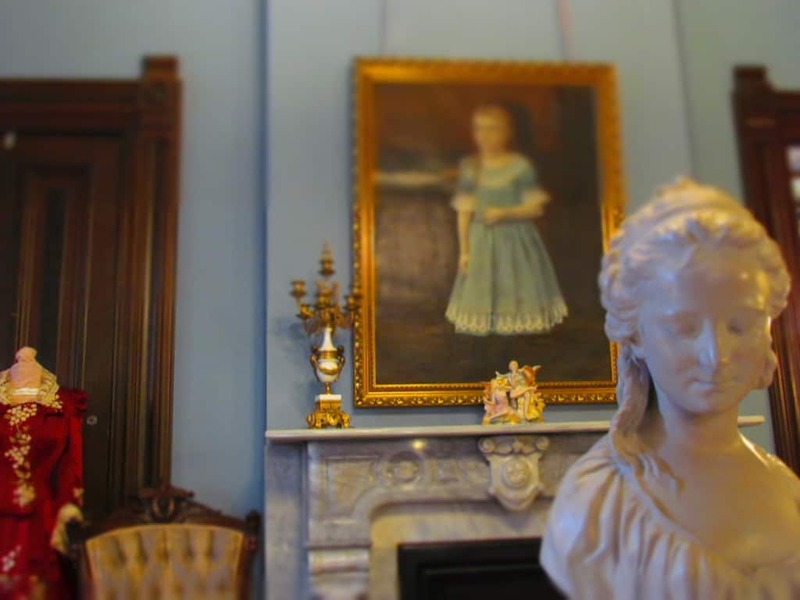 These days the Vaile Society serves as guardians of the home and the volunteers are the ones who offer tours throughout the year. They are also responsible for the fundraisers that happen a few times each year. The day we visited happened to be the annual Strawberry Festival. All around the grounds we found a whirlwind of activity. Just outside the exit from our tour of the mansion was a tent filled with volunteers serving up delicious strawberry treats. Visitors could purchase a sumptuous snack to enjoy while listening to a patriotic performance by the local orchestra. As we made our way around the grounds, we found loads of tents filled with a variety of handmade novelties, crafts, and art. We strolled through and made a few purchases. We even ran into an old friend in the crowd. Everyone seemed to be enjoying the festivities. 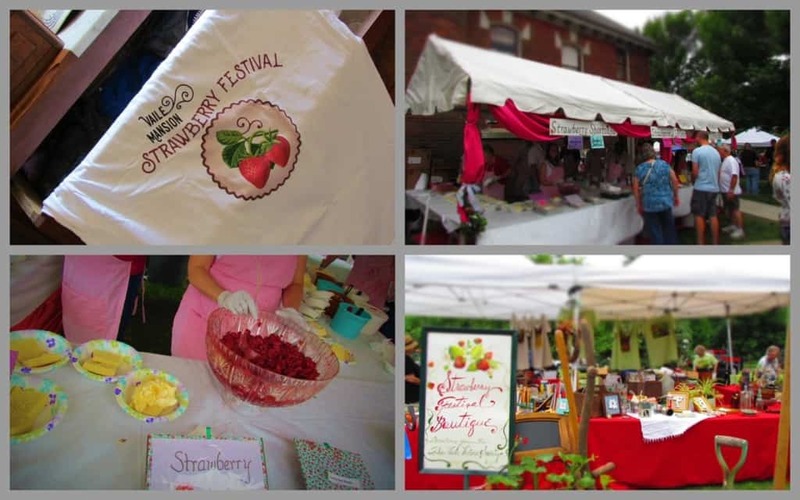 The Strawberry Festival draws a lot of visitors, because they have assembled a good selection of activities for guests. 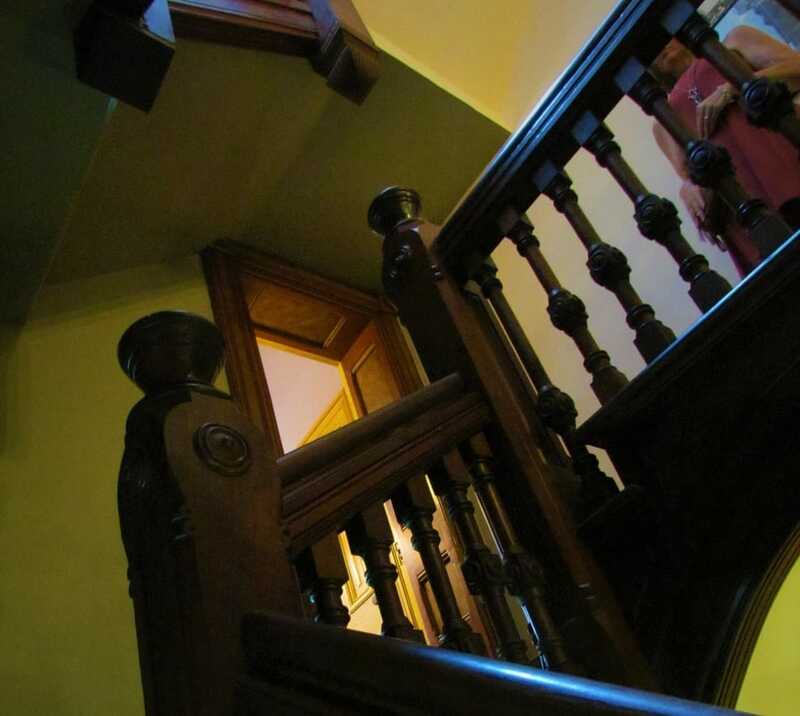 Since the Vaile Mansion sits about one mile from the Independence Square, they are able to offer the services of the Pioneer Trails Adventures. We had the opportunity to enjoy a ride with this group on an earlier visit to the historic square. (You can read about it here>) It was certainly a fun adventure filled with its own collection of ‘tales from the trail’. 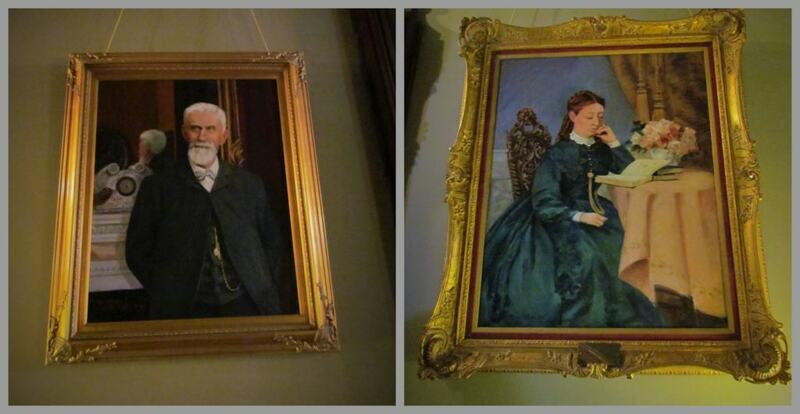 There was still one more surprise for us during our visit to the Vaile Mansion. 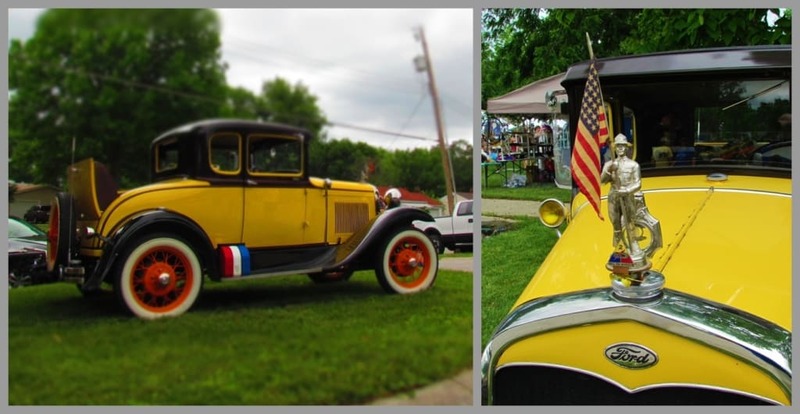 Sitting near the edge of the home’s property we spotted a beautifully restored 1931 Ford Model A Deluxe Coupe. It’s owner, George Deel, happened to be sitting nearby and was happy to tell us a little about the history of this fine automobile. He purchased it for $25, which his father said was far too high for its condition. After a complete restoration, including all four fenders and the driver’s door, he finally brought it back to original condition. It was certainly a great finish to our visit and gave us our own ‘tale’ to tell. Now that we have seen the interior of the mansion, we are eager to visit during Christmas Time when they decorate the whole place for the season. 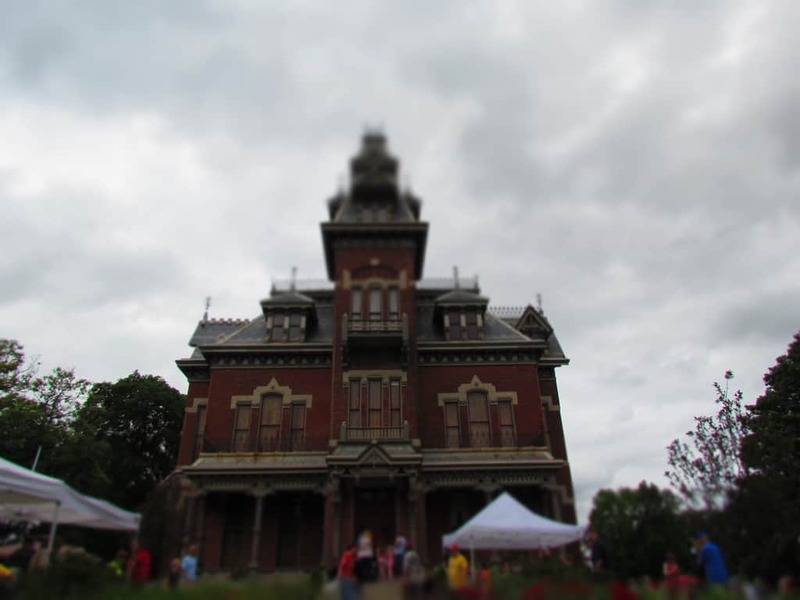 Have you ever had the chance to tour the a place like the Vaile Mansion? Tell us a little about your own story! Lovely pictures guys. Fascinating looking place too. I dig spots rich with history. Thanks a bunch. It’s nice to know you are enjoying our articles. If you have the opportunity to visit during Christmas, it is really worth it! The volunteers try to change the decorations around every year so there’s is something new to see. Your best bet is to see it outside of the holiday season so you can truly appreciate the home for the beauty offered within and then again during Christmas to indulge in the grand scope of decorations that are featured in this home. Either way you look at it, this is a must see! We are certainly planning on a visit then. The volunteers painted a picture of it during the season that seemed quite beautiful.